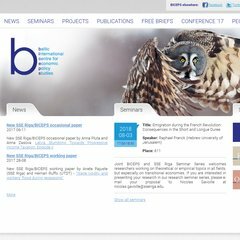 www.Biceps.org - News | B.I.C.E.P.S. Tópicos: Biceps Funding, Biceps Governance, Research Projects, Seminar Series, The Teliasonera Institute, e People. biceps.org Inflation in the Baltic states and other EU new member states: Is ..
biceps.org Modeling the Impact of Marketing Drivers on Consumer Behavior. An ..
biceps.org The Baltic states and Europe: common factors of economic activity ..
biceps.org Baltic Journal of Economics | B.I.C.E.P.S. Os 2 nameservers são nsz2.nic.lv, e nsz.nic.lv. O endereço IP do site Biceps.org é 159.148.79.202. Está hospedado em Latnet Isp Riga, utilizando um servidor Apache.